On Wednesday I am playing a 500 point game against by friend Daryl and his new Dark Eldar. In it I had decided to run a pair of Datasmiths as Dominus bodyguards. Luckily thanks to the multitude of Kastelan Robot kits I own, I was able to toss a second one together. 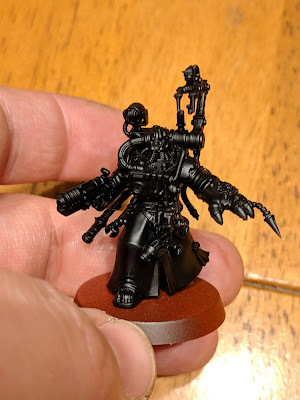 I primed him as well, but he won't likely get painted for awhile. 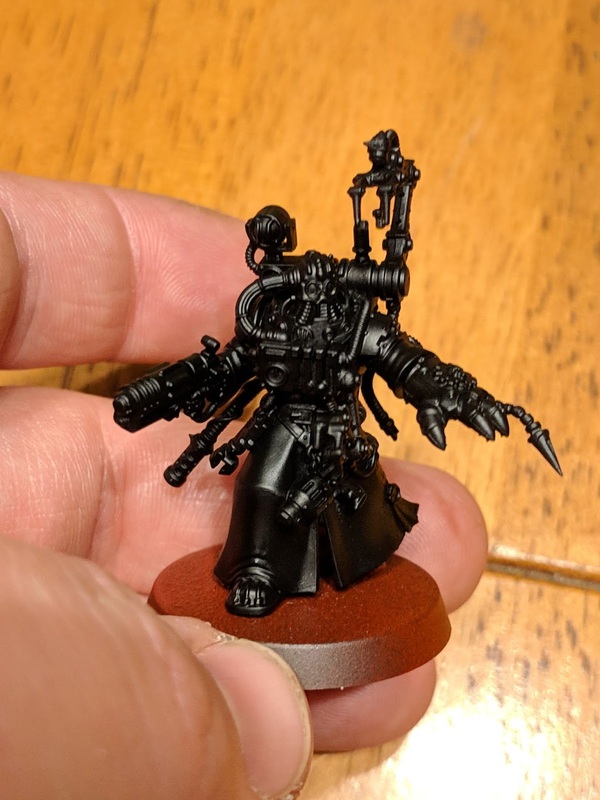 I've decided that my atheistic for futre terrain will be fantasy style buildings covered in pipes, hoses and smokestacks. 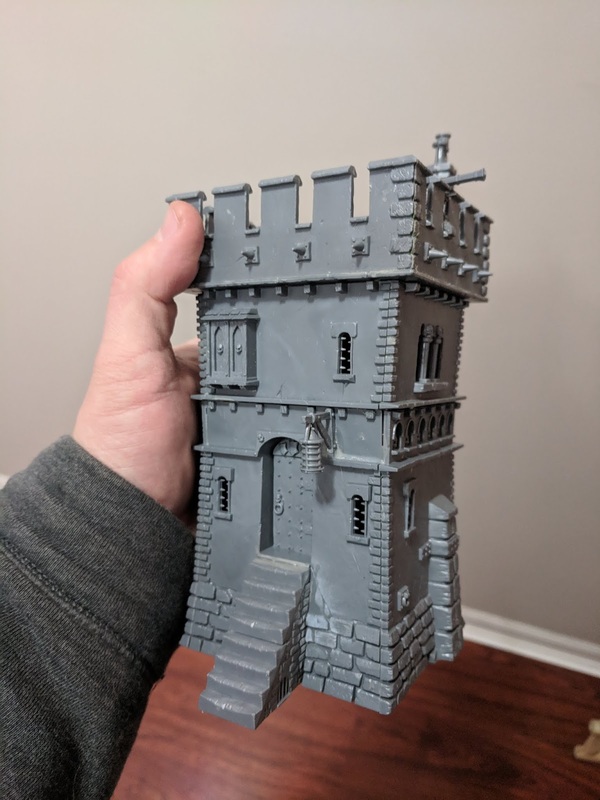 With that in mind, I found this tower and will eventually be Admeching it up. But I need to gather many more pieces. These will be a long term project and they should be a good time. 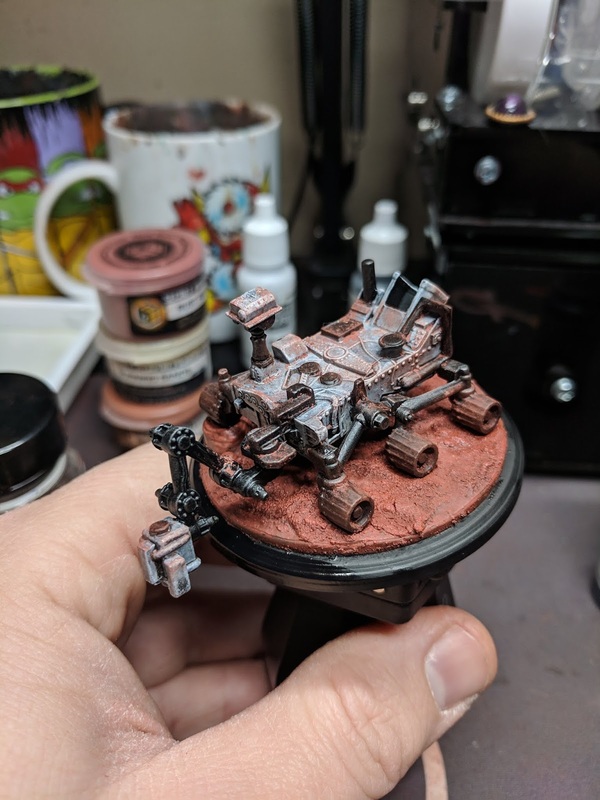 Wednesday night I finished off the Mars rover for Terraforming Mars and the Thanksgiving game we were planning to play. 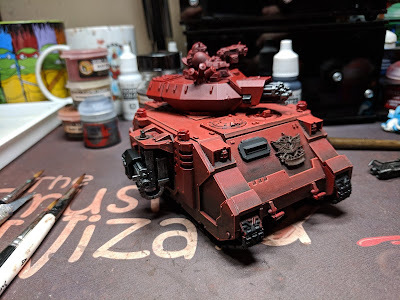 I dusted it up with some weathering pigments and then sealed it again with dullcote to try and keep the dust as contained as possible. This fella was a big hit during the game, which is great. I wish I had the time to put tire tracks in the dirt, but since it was just a fun quick piece I think its fine as is. Last week I primed the Baal Predator and now I've gotten some solid progress on it. As of Monday night I had the front, top and right side all finished. 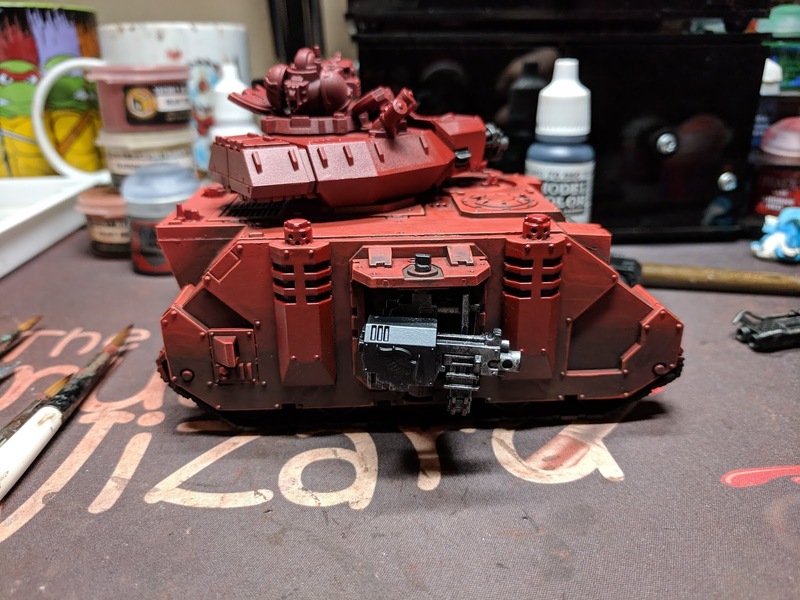 I still need to do the column sections on it and the gun housing, but I'm liking where this is heading! 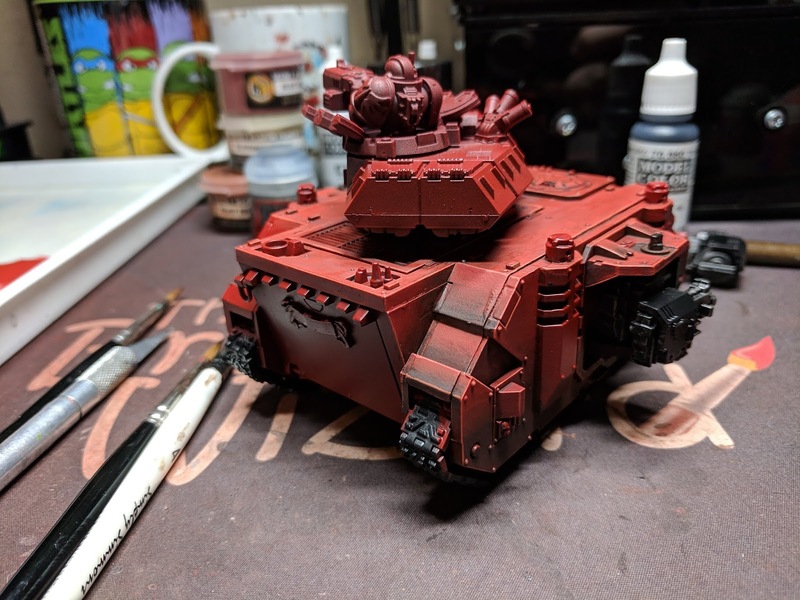 I've gotten a lot of compliments about the fade on the armor plating so far. I will be recording how to paint this red for Let's Paint once the main body is done. I'll likely be using the turret for the example piece... but I haven't really decided that yet. That's it for now. There's a lot of work left to go on this one and I keep wearing paint on the corners of the light shrouds. I need to keep powering through it though, I'll do touch ups when its finished. Plus I'll be weathering it with sponges too. So a little worn paint isn't going to be a huge deal.